"Standalone Electronic Lock - Ideal Solution"
- Function: Storeroom / Classroom. - Lever Option: Sparta (SPA). - LD/BD/JD Models: Sold Less Cylinder. For Cylinders see "Companion Items" below. - Delivery: All Schlage CO-series Sparta Levers are factory-ordered, please allow 3-5 working days' lead time. Introducing the new CO-Series from Schlage. It gives you added the security and convenience of electronic access control without the cost or complexity of a networked solution. CO-Series locks offer a range of options to meet your needs. In the world of standalone electronic locks, nothing compares to the CO-Series from Schlage. 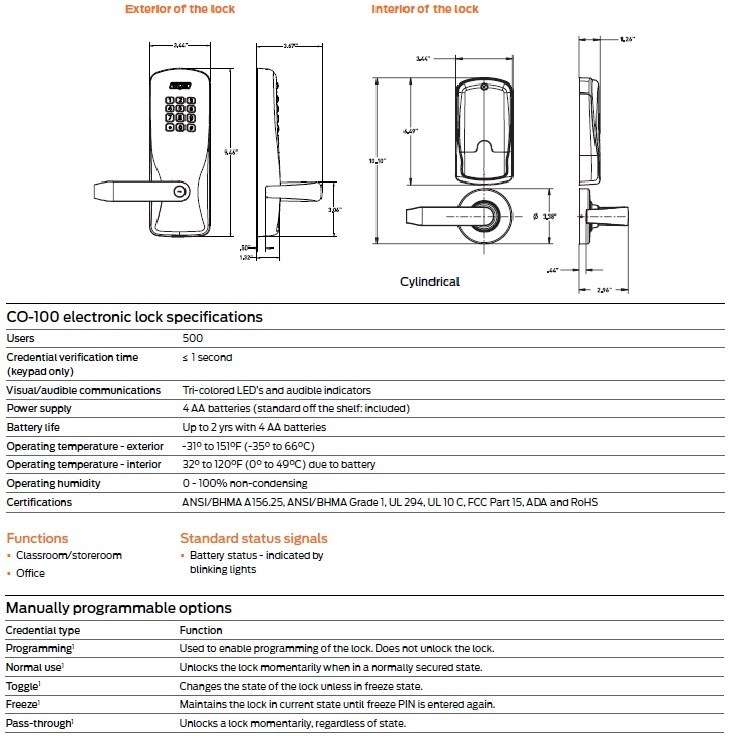 The CO-100 is an offline keypad programmable lock, recommended for openings with a relatively small number of users. (Maximum of 500 Users). The CO Series is the ideal solution for customers seeking the added security and convenience of electronic access control without the cost or complexity of a fully networked system. Compatibility: The Co-Series was designed to easily integrate into your facility. It can work in conjunction with Schlage and Locknetics electronic locks and offers expanded cylinder, exit device, and credential compatibility. The CO-Series is compatible with many different brands and credential technologies that include but are not limited to Schlage, XceedID, and more. In Classroom application, a toggle credential can be used to put the lock into a "locked" or "unlocked" state. In a storeroom application, the lock unlocks when a credential is presented and relocks automatically. All functions allow for free egress. - Up to 500 unique 3-6 digit PIN codes stored on the lock. - ANSI/BHMA A156.25, ANSI/BHMA Grade 1 certified and UL 294 Listed. - Classroom/Storeroom function and office function available. - Chassis options include cylindrical, mortise, and exit trim. - Compatible with most major brands of key systems and exit devices. - Normal, toggle, pass through, and freeze credential attributes available. The Schlage Commercial CO-Series Levers are reversible. The CO Series has been tested the highest standards in the industry to ensure the quality and reliability you have come to expect from Schlage. The CO Series is ANSI/BHMA A156.25, ANSI/BHMA Grade 1 certified and UL 294 Listed. Function: The Schlage CO-Series Levers are available in Mortise (MS) function. Finish: The Schlage CO-Series Levers come in Satin Chrome (626) finish. Lever Design: The Schlage CO-Series Levers come in Sparta (SPA) design. Cylinder Options: All Classroom/Storeroom (LD/BD/JD) functions are sold Less Cylinder; see "Companion Items" above for all Cylinder & Keying options. Credential verification time (keypad only): 1 second. Visual/audible communcations: Tri-colored LED's and audible indicators. Power Supply: 4 AA batteries (standard off the shelf: included). Battery life: Up to 2 yrs with 4 AA batteries. Operating temperature - exterior: -31° to 151° F (-35° to 66°C). Operating temperature - interior: 32° to 120° (0° to 49°C) due to battery. Operating humidity: 0 - 100% non-condensing. Certifications: ANSI/BHMA A156.25, ANSI/BHMA Grade 1, UL 294, UL 10 C, FCC Part 15, ADA and RoHS. Strike: ANSI curved lip strike 1-1/4" x 4-7/8", 1-3/16" lip to center standard. ANSI Standard: Meets or exceeds A156.25 and A156.2 Series 4000, Grade 1 strength and operational requirements. Special Order Information: For pricing on any function or finish of the Schlage Commerical CO-Series Levers not found on this page please contact Taylor Security direct via e-mail (sales@taylorsecurity.com) or call us toll-free at 1-800-676-7670.